TERMS: UPS shipments require street address.U.S. Postal Money Orders get shipped within 3 days; checks take 3 weeks to clear before shipping. * EACH SMG PARTS PACK CONTAINS: manual,used mag.,assembled bolt, stock & upper receiver assemblies, trigger guard,mag.housing, sear stud & stock block. **ALL SILENCER PACKS CONTAIN: manual, new wipe assembly, spirals & baffles. YOU GET EVERYTHING EXCEPT THE LOWER RECEIVER & THE 2 SILENCER TUBES. SEND A STAMPED, SELF-ADDRESSED ENVELOPE FOR FREE PRICE UST. Myth and conjecture have made the De Lisle System one of the least understood weapons of the clandestine forces of WWII. The reader can quickly understand why the Commandos found it necessary to have a weapon that would kill a man, silently, out to a distance of a hundred meters. The criterion for such a weapon was that it be as efficient as possible»accurate,lethal,silent and compact. It was of paramount importance that enemy guards be eliminated in those situations where they could not be to be shortened approx. .50mm. 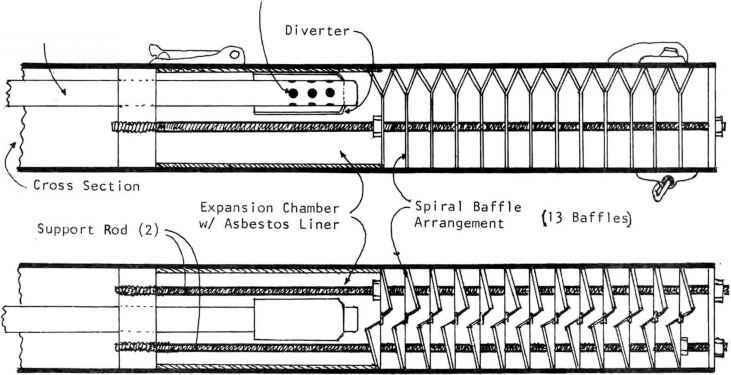 The Thompson barrel's breech was reamed to seat the cartridge more fully and a cutout was made in the chamber to permit entry to the Enfield^ extractor. 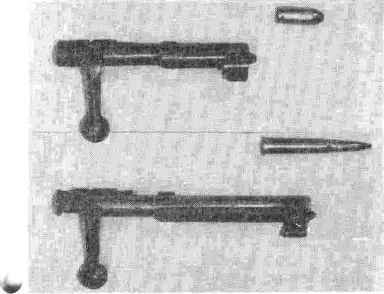 The firing pin,although shortened to suit the dimensions of the shortened bolt, remained unchanged as did the bolt face,and as luck would have it, the extractor fitted the . 45's cannelure without modification. The charger bridge was removed and the box mag was replaced with a housing that would accept a .45 pistol mag. 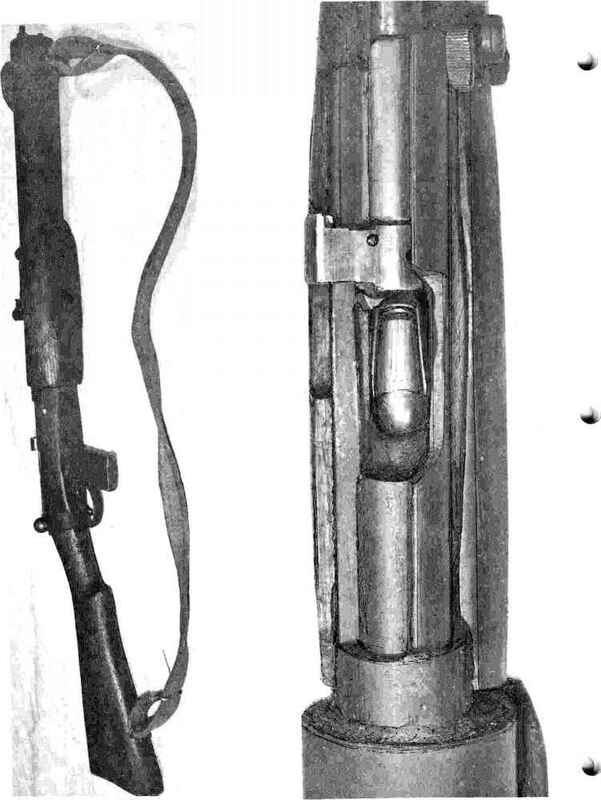 The mag itself had a lug brazed on to enable it to be held by the Enfield's mag catch. This queer weapon functioned perfectly and loaded the Colt ammo without difficulty. The De Lisle Carbine. All photos courtesy of the author approached with the knife. Mr. W.G. De Lisle of Poole, Dorset and the scion of a famous British breakfast cereal company, conceived of a firearm that brilliantly fulfilled these needs. It was evident to De Lisle that the weapon would have to be a carbine and that the only cartridge that did not require special loadings and modifications was the .45ACP which was used in the Colt Auto and Thompson SMG, both "issue" items of the British Commandos of the time. 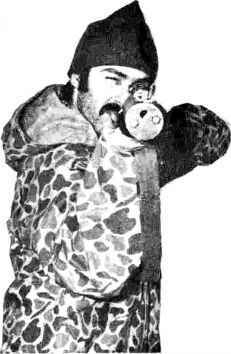 A prototype of the weapon was produced in a few short weeks. It was a cleverly simple design and had all the earmarks of the "Why didn't I think of that?" Syndrome. The standard .303 Lee-Enfield was cut at the junction of the barrel and the receiver and then bored out to accept a turned down Thompson barrel that was forced into the receiver, which in turn meant the bolt had the. silencer,I was told that the design came from the examination of a farm tractor's muffler. His improvements were noteworthy and a patent was filed on them after the War (1947). The silencer had an expansion chamber and ingeniously simple spiral diffuser system. The 13 baffles were mounted and spaced for effect on two threaded rods that ran parallel to the barrel and made for perfect alignment with the bore and a rigid support for the baffles. The silencer casing is perhaps the largest in volume of any silenced weapon of this type and made it the best possible weapon made for special combat use. The weapon's detractors point to the working clatter of the bolt as a drawback to its silent role. I can only point out that plastic inserts were used on the later models where these metal surfaces met. The sights were the issue-Enfield type bat the ranging marks of the .303 were buffed away and the combat distances that corresponded to the trajectory of the Colt bullet were substituted. Some models used ^ the simple 100-200 yd. flip sight of the Lanchester SMG MK1*. 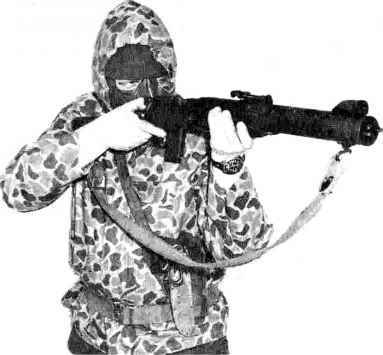 The weapon was given to individuals in the Commando and Airborne (Airlanding) Forces and every one that I have examined ^ has had some variation from the others.Different sights,lengths,forestocks,false muzzles, extension mags and folding rear stocks were just some of the variants encountered. The weapons were to this extent tailored to fit individual requirements of the group that would be using them. Another report was that S.0.,E. 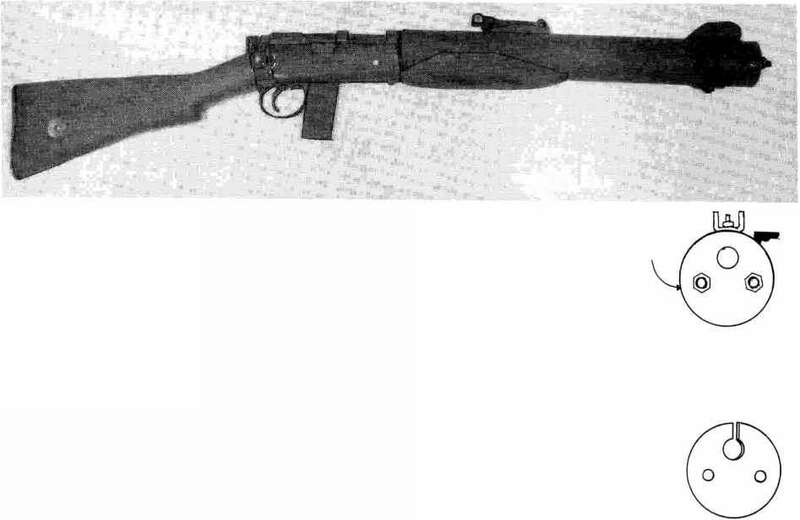 personnel in training were testing this weapon and the shooter complained that his carbine was mis-firing until it was pointed out to him that there was a .45 cal. hole in the target. I have tested the weapon extensively and as is my habit I always test any silenced weapon indoors so as to get the maximum reverberations and to magnify the sound-emit-ting propensities existing in the design so as to better judge its effectiveness in o-vercoming this problem; I can report that the De Lisle passed this subjective test with flying colors. Because of its heft it is a very stable shooting platform for the .45 and recoil is not a consideration. The Thompson barrel's length makes the weapon very accurate at long range, although the claims to between-the-eyes accuracy out to 400 m.could not be attested to by me and should be considered apocryphal. It is not a sniping weapon per se and 100 m.is its designed-for-killing range. The best description of the sound when firing that I can convey to the reader would be the sound of a book dropping from your desk to the floor—a flat,hollow thud. Audible but not overly noticeable. There is no flash emitted from this weapon when firing. Distinctive Features: Two setting rear is easily dismantled and swabbing with a gasoline-soaked rag cleans up any residues. The folding stock version uses the stock from the Patchett SMG. Its sling swivels are side-mounted and the silencer casing flattened along one side to form a more body hugging configuration. sight (Lancester), MK1* Short mag.shroud. ii / Mk 2 (Stand. Issue) Overall Length: 887 ram Length of Silencer: 393 mm Diameter of Silencer: 50 mm Silencer Volume: 770 cc Sight Radius: 320 mm Length of Silencer Stock: 195 mm Distinctive Features: Sliding tangent rear sight Mk 1 Lancester type, no false muzzle. / Mk 2 (Folding Version) Overall Length (folded) : 635 mm Weight: 3.25 kg (Duralumin silencer casing) Distinctive Features: Pistol grip rear stock and extension mag. The following catalogs contain those unique types of items that never seem to be in stock at the local hardware store.Please write to each for their current catalog price and further info.These catalogs are valuable reference sources even if you never order a thing. Include a signed FFL for dealer discount sheet. Brooks tone-' 'Hard to Find Tools & Other Fine Things"
127 Vose Farm Rd,Peterborough, New Hampshire, 03458. Brookstone has tool designs from the nineteenth and early twentieth century that no one else seems to carry anymore. Tools for working with the latest space age materials and just about everything in between. If you need a special hand tool, they have it.Warning! Everytime you look through the Brooks tone catalog yoifll see another tool that you '"have to get". Great to leave laying around the house at Christmas time! Wag-Aero Inc.-"World*s Largest Inventory of Aviation Parts and Accessories"
These folks cater to the people who build,fly and service private planes. Items like $8 propeller spinners (for missile nosecones) and chrome moly tubing % to 1%" OD. Tools for cutting,rolling,bending, and riveting sheet metal. You'll find struts and fittings for building gunmounts and rocket launchers, navigation gear,complete plane engines, hinges,cables, and much more. South Bend Replicas,Inc.-"A Catalog of Antique/Replica Ordnance"
This fine catalog is a MUST if you are interested in black powder cannons and mortars. South Bend Replicas sells nothing but cannons from little ones for guarding the fireplace to the big guys that weigh in at over 1,000 lbs.All models can be ordered bored to % depth for inert display pieces, (these are no fun), or fully bored, finished and ready to fire.Cannons are produced in both cast iron and brass versions. All shootable models are cast solid,bored by drilling and sleeved with seamless ordnance steel liners. These are the best you can buy,and are certainly a hell of a lot safer and more accurate than their 19th century counterparts. Over half of the catalog is filled with photos,tips and general info valuable to cannon folks and of interest to anyone who likes guns ^military history, foundry or carriage work etc.Write for price and other info. Navy Arms Company - 689 Bergen BlvH77Ri3ge?ield, NJ 07657. Manufacturers of replica breech and muzzle loading rifles and black powder pistols.They also offer a complete line of accessories for these weapons. Navy Arms also carries the Greener Harpoon Gun (PMA Vol.1 pg.91)including ammo and replacement harpoons. A ready supply of improvised hand grenades can be made in the home workshop at a cost of about 75C apiece. These grenades are easy to make and are just as effective as regular grenades. There are two kinds, offensive and defensive, in which both use the same fuse assembly. Additionally,these grenades use readily available materials and can be put together in 15 minutes. The heart of these grenades is the fuse assembly, therefore I will describe its production first. The materials needed for drilled insert the safety pin. This wt11 hold the 3/4" dowel in place (see diagram)| The length of glass tubing can be removed. The installation of the chemical ignitor rema i ns. Construction of the chemical ignitor is started by making the acid filled vial. Make this vial by cutting a length of 5 mm glass tubing the same length as the O.D. of the PVC pipe. Next seal one end of the tube with 1/8" of paraffin by dipping it in melted wax. Now fill the tube with sulfuric acid using a glass eyedropper, etc., leaving a 1/8" air space. Fill this space with wax. The vial can now be inserted into the PVC pipe and taped in place. Finish the •fuse' by inserting a 2" x 2" square of chlorate paper next to the acid vial (see diagram). The fuse assembly is finished. Start construction of the grenade by drilling a 3/32" hole through the center of the 3A" dowel. Then epoxy the fuse Into this hole leaving ¿"exposed on either end. 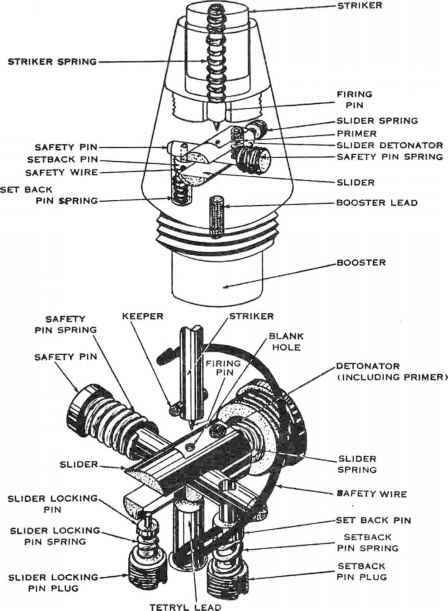 Now place a small amount of chlorate paper on one fuse end to insure it ignites (see diagram). Next cut 1" off the open end of the 'fuse' assembly and epoxy the dowel (chlorate paper end first) into it. The chlorate paper on the dowel fuse should contact the chlorate paper in the fuse assembly (see diagram). Continue by cutting a hole the same diameter as the 'fuse' in the center of one of the plywood plugs. E-poxy the fuse assembly into this hole leaving 1" of the dowel end protruding out.Now epoxy this plug into the cardboard tube with the dowel end of the 'fuse' out. 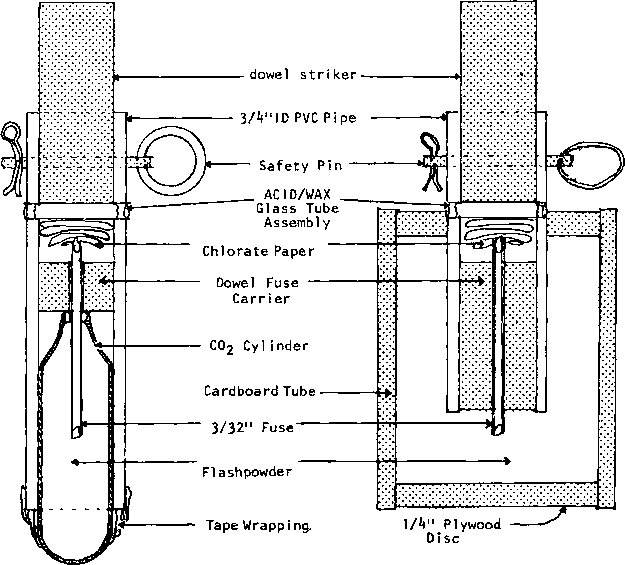 Fill the cardboard tube with flashpowder and e-poxy the solid plug onto the other end of the tube (see diagram). The grenade is fi nished. The firing procedure for these grenades is as follows. First,grasp the grenade in your hand with the dowel end up. Second., pull the safety pin out. This arms the grenade. Third,strike the dowel end sharply against the palm of your hand, etc. There should be a 'hissing' sound and a small a-mount of smoke should come from the dowel end. This indicates that the chemical igniter has functioned. Finally hurl the grenade at your target immediately and take cover. The grenade should explode in five (5) seconds. You now know all you need to make and use my grenades, however, there are a few additional items. I will list these for convenience. 1. Use the offensive grenade to daze and stun the enemy and use the defensive grenade to inflict casualties. 2. 2" PVC pipe can be used as a fragmentation sleeve for the offensive grenade. 3. Grooves,etc. can be filed into the CO2 cartridge or fragmentation sleeve for better fragmentation. k. Wax placed around the striker makes an effective air and water seal, while a coat of varnish on the grenade will make it waterproof. 5. Offensive grenades can be used for smoke or incendiary purposes by replacing the flashpowder with the appropriate filler. 6. Both grenades make effective landmines when buried exposing only the dowel. Sheet wood can be placed on top of the dowel for increased surface area. 7. Survivalists, etc. wishing to store these grenades should remove the acid vials and store them separately. Buffalo Rd.»Rochester,NY 14624. Catalog $1. Merrel has a good line of chemicals and labware with fast delivery. High melting point wax, glass tubing and glass tubing cutters can also be purchased from Merrel. 9. High melting point wax or acid proof epoxy can be used to more effectively seal acid vials. Use this for grenades to be stored. 10. Check PMA Vol.1 #1 for additional grenade information. How to build a sound suppressor a silencer? How to make a homemade silencer / suppressor? How to make a rifle sound suppressor? How to make a sniper rifle barrel from seamless pipes? How to build DeLisle carbine 45 acp? What is a sound baffle?